We have fallen in love with Aiken SC and have owned a home here for several years. We now have relocated here permanently and experience all that Aiken has to offer year round. Aiken has long been a visitor's paradise, from it's early days as a health resort to it's current distinction as one of the best places in the USA to retire and live. The locals are extremely warm, friendly and eager to make your stay as pleasant and comfortable as possible. We recommend Aiken as a great place to visit! The town name? The South Carolina Canal and Railroad Company was established in 1828. William Aiken was first President of the Railroad Company and the town was named in his honor. Construction is complete on a restored train depot on its original downtown site and houses the Aiken visitors bureau. Visitors can now get a view of Aiken just as you might have many years ago. A short history of Aiken can be found here. I have recently become very interested in expressing the right side of my brain through watercolor paintings. A gallery of my paintings is available here. Click on the picture below to see my home network. "Laughter is the sound that knowledge makes when it's born"
Welcome to the home of the Oldcyberdude. 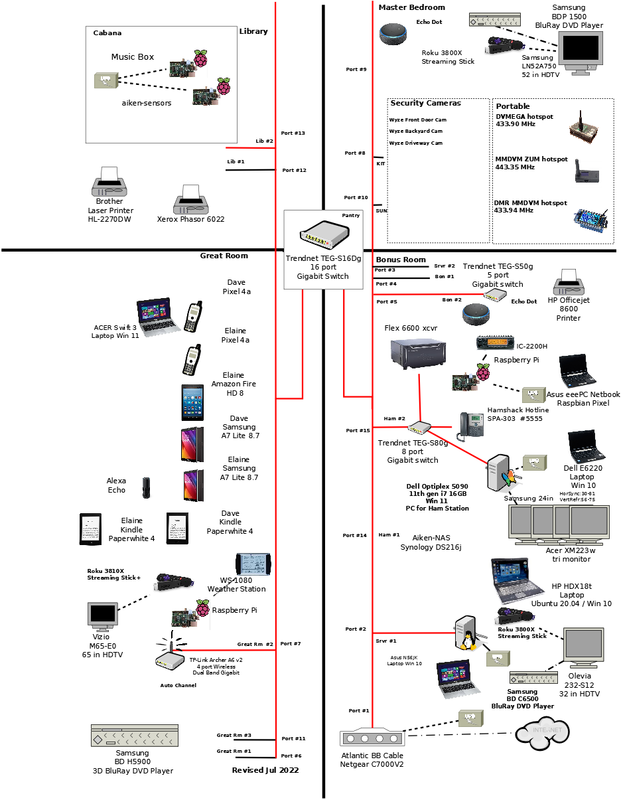 This is my home page and documents some of the new tricks learned by this 'Oldcyberdude' including mostly my Linux toys and ham radio toys. I will periodically update this site (see changelog) to provide sources and references to things Linux and ham radio that may be of interest to other oldcyberdudes. This oldcyberdude started out as a young lad taking apart old television and radio sets when active components glowed and before components could only be seen under a microscope. As a teenager, I became a ham thanks to the Bloomfield Amateur Radio Club, Bloomfield Ct. and thus started a life long interest in communications and antennas. My ham activity has ebbed and flowed with demands of school, family and profession. I have had major stations with tri-band beams and a 70 ft tower. Since moving to Aiken,SC I'm no longer constrained to attic antennas in a townhouse. I now enjoy an outdoor wire antenna in the trees for 160/80/40 meters. And, thanks to friendly neighbors, I have a hex beam for 20-10 meters. With 18 months of operation I believe the hex beam is by far the best performing antenna for the dollars invested! My ham pages still provide my lessons learned from my townhouse days. These pages will be limited only to my value-added information i.e. no long lists of unmaintained web links. In order to delay as long as possible the inevitable related to age, I took up bicycle racing again after a hiatus of more than 15 years. Though avid, I am a mediocre racer in terms of palmeres (French term for results history). Since moving to Aiken I have retired from racing but still ride regularly with the Aiken Bicycle Club. But if would like to see some great amateur bicycle racing come out to a race in Southeastern PA or Southern NJ from March to Sept. You can also join me for a ride with the Aiken Bicycle Club. If cruising this site is more your speed, my race photos can be found here. As a son of a school librarian, I have had a life long appreciation for and love of books. Both Elaine and I are avid readers.